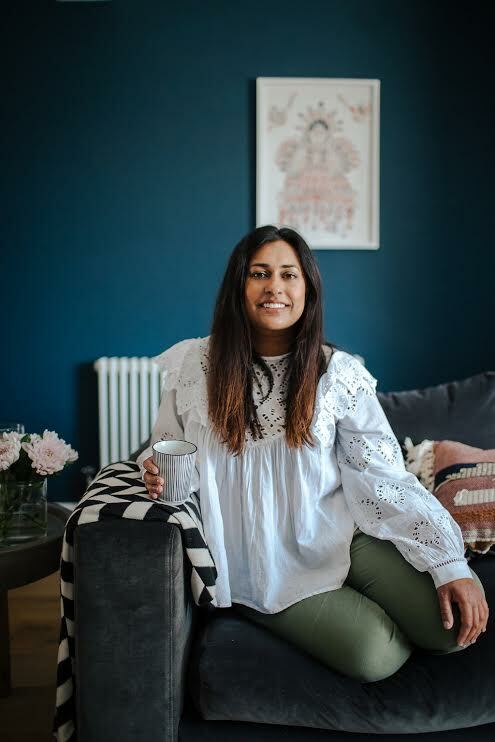 Get to know Reena Simon of Hygge for Home. Hygge for Home‘s founder Reena Simon knows cozy. The Cardiff, UK-based blogger’s style is largely influenced by Scandinavian design and if the title of her blog is any indication, it’s all about comfort. With a steadfast dedication to creating functional yet livable spaces, Simon’s knack for merging the gap between small spaces and tight budgets is nothing if not inspired. When it comes to her work, textured accents go without saying and an affinity for moody tones coupled with natural elements results in a unique aesthetic we simply can’t get enough of. Ahead, get the full lowdown on Simon’s inspirations, style, and the biggest design risk she’s taken to date. My work/space is inspired by (and why): Nordic design—I just think they do cozy so well and cater to family living. I’m 10 times more productive when: I don’t have my trio of little ladies around! My biggest design splurge was: I haven’t really had a major design splurge but I did design my own dining table and bench and had it made by a wonderful team of local designers. On the weekends you can find me: Taking my little ladies on their Saturday activities, which are usually ballet and swimming followed by a trip to the park. A Saturday night is a takeout and movie night and Sunday is family day: We stay in our pajamas for as long as possible then visit our mums and cook a Sunday roast. What’s the biggest design risk you took that paid off? I went really bold in my kitchen with monochrome patterned tile. They are not to everyone’s taste and I had only ever seen them used in small spaces. I broke up the pattern and intensity of them with a huge jute rug and our dining table. Name a designer who is currently inspiring you. The British designer Tom Raffield. I am absolutely desperate to splurge on one of his stream bent pieces. Tom makes steam bent furniture and lighting out of wood and just last week launched his range in America! He is definitely one to watch. What’s a throwback design trend you’re hoping will make a return? This may be controversial but…bean bags! I am an ’80s kid and have so many happy memories around them—relaxing with friends or playing Sonic the Hedgehog on the Sega Mega Drive! None of what I do feels like work. I feel incredibly lucky to be able to call myself an interior blogger and work for myself. I also feel lucky to have had so many “pinch me” moments over the past two years, from work I have done with dream brands to making lifelong friends from the “online world,” (still a concept I find hard to get my head around!) to now winning this award. It all feels like a total dream. Hygge for Home is the winner of the Best International Design Blog in the Domino Design Blog Awards.